Music is an integral part of our expression of faith and worship. First Baptist is a place where musical talents are celebrated and where musicians can offer their gifts in praise to God. If you want to know what we believe, just listen to our music. It may be the strongest statement about our faith. The music ministry of First Baptist seeks to be just that: a ministry. We strive to minister not only to our church family, but to our community. To accomplish this, the church offers a variety of musical experiences such as graded choirs, handbells, musical ensembles, and special emphasis on congregational music. Music ministry at First Baptist seeks to give glory to God and be a witness for Jesus Christ. We hope that you will be a part of this ministry. The purpose of children’s choirs at First Baptist is to teach basic biblical and musical concepts. Although the children’s choirs are not designed as performing groups, the children do sing in worship services and special events throughout the year. The choirs meet on Wednesday evenings September through May. The youth are invited to share their musical talents throughout the year by singing solos, singing in a choir, playing their band instruments and playing handbells. 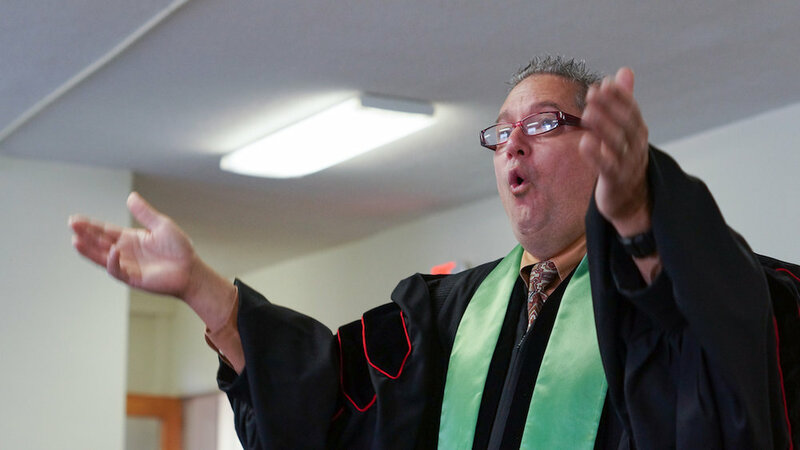 Led by Dr. Thomas Hinton, our Minister of Music and Youth, the adult choir is a committed and fun group of singers who rehearse each week. Whether preparing a traditional anthem, spiritual, special music for Christmas, or songs to lead worship at Alexander Correctional Institute several times a year, we strive to prepare well. Above all, our primary purpose is to honor God through music. The adult choir rehearses each Wednesday in the choir room. If you would like to sit in on a rehearsal, please contact the church, and Dr. Hinton will be glad to answer your questions and help you find the choir room. The handbell choir rehearses weekly and assists in worship several times each year. The group also shares its talents elsewhere, serving as First Baptist’s ambassadors in other area churches and participating in regional handbell festivals. Congregational singing is an important component of worship at First Baptist, supported by our gifted organist and pianist, Todd Wright. We enjoy traditional and new hymns found in the 1991 edition of the Baptist Hymnal. Dr. Hinton carefully chooses hymns to complement each Sunday’s worship focus.